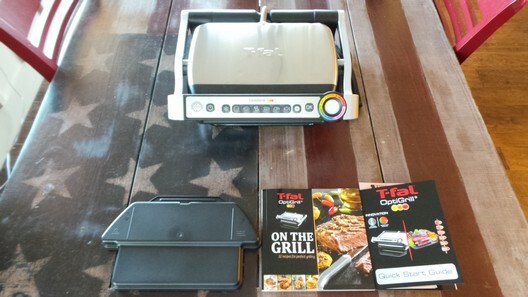 This week’s review is on the OptiGrill by T-fal. The OptiGrill is an indoor grill that automatically cooks different types of foods based on sensors and thickness of the food. 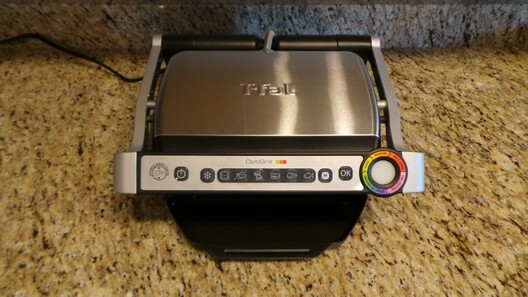 It has 6 predefined settings, with the option to defrost food, as well as a manual cooking mode for grilling fruits and vegetables or personal recipes. The OptiGrill has a very stylish looking brushed stainless steel housing and die-cast aluminum grill plates with a non-stick coating. 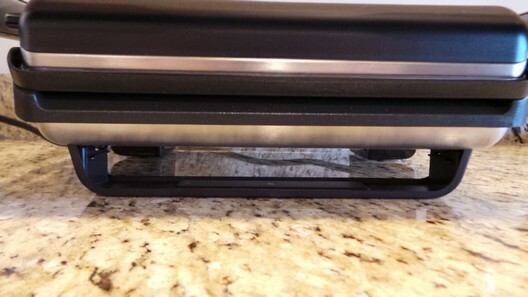 The removable grill plates and large drip tray are very easy to clean and dishwasher safe. 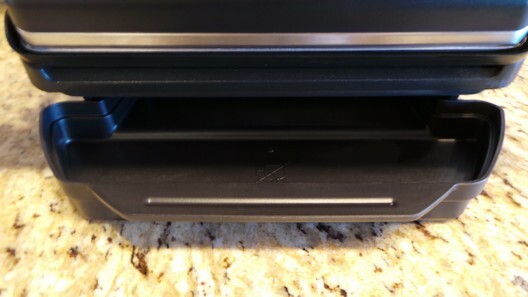 The grill is also angled so that the fat drains down into the large drip tray. 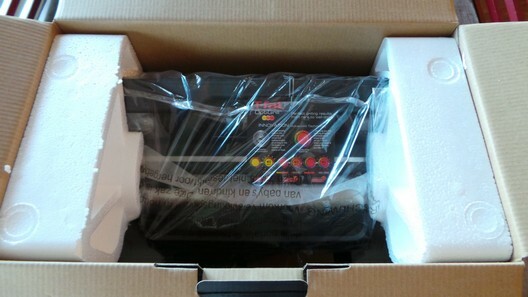 Below is a picture of the box that the OptiGrill came packaged in and everything that was included inside it. Also included in the box was $200 in savings coupons from Omaha Steaks. 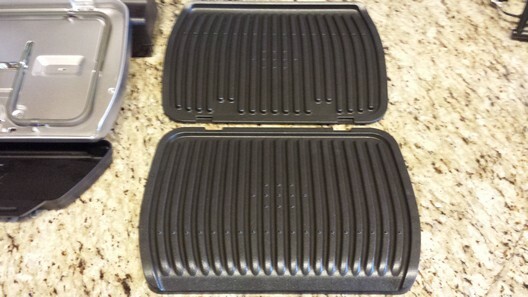 Once I got everything out of the box and before using the OptiGrill for the first time, I thoroughly cleaned the grill plates off with warm soapy water and then dried them. 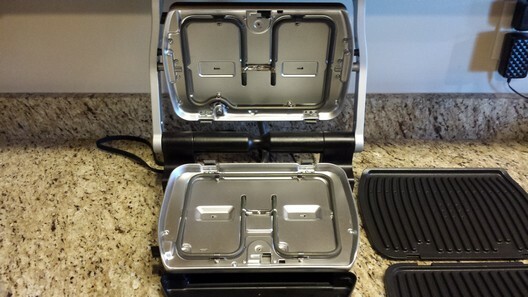 Below are some close up pictures of the OptiGrill with its removable grill plates and large drip tray. Now it was time to do my first cook on the OptiGrill. 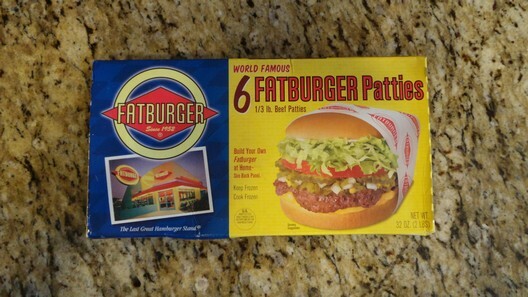 I decided to grill some FATBURGER Patties and try out the frozen food setting. 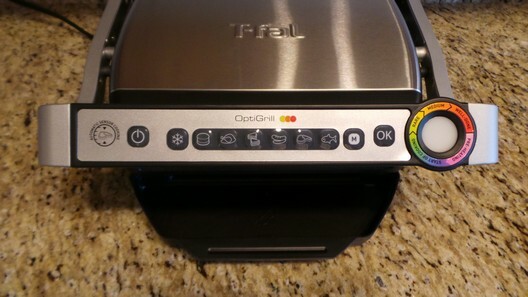 I plugged in the OptiGrill and pressed the On/Off button. Then I pressed the frozen food button and selected the burger program button. 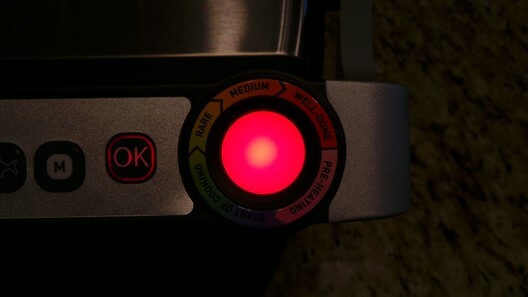 After that I pressed the “OK” button and the OptiGrill started to pre-heat. 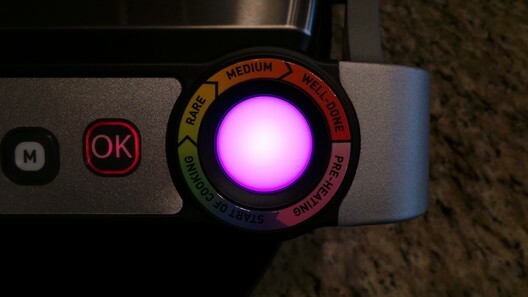 The cooking level indicator light flashed purple to let me know the OptiGrill was pre-heating. After around 5 minutes an audible tone sound went off letting me know the OptiGrill was pre-heated and ready to go. I then opened the lid and placed on the burgers. Once I closed the lid the cooking level indicator light turned blue and then became green to indicate the cooking cycle had started. During the cooking process a beep sounds alerting you that the “Rare” cooking program (yellow cooking level indicator light) will begin. 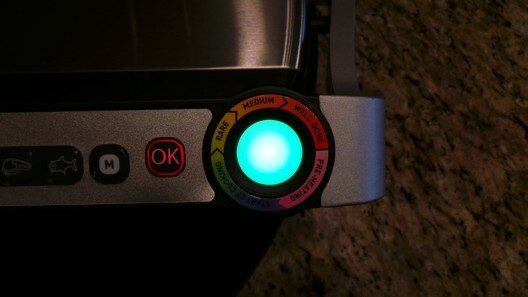 According to the degree of cooking, the cooking level indicator light changes color. When the indicator light is yellow and the beep sounds, the food is rare. When the indicator light is orange and the beep sounds, the food is medium. Finally, when the indicator light is red and the beep sounds, the food is well-done. 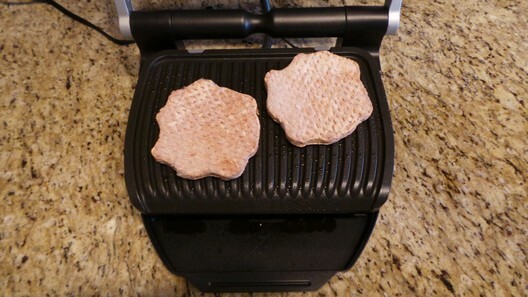 I decided to grill these frozen burgers to well-done, so after around 12 minutes the indicator light turned red and the beep sounded and the burgers were ready to be removed from the OptiGrill. I then added some cheese to the burgers and then it was time to eat. 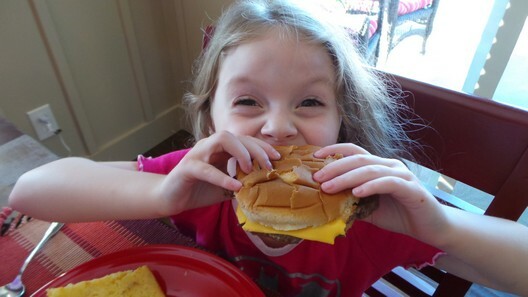 As you can see my daughter loved her burger and I loved mine as well. They were very juicy and perfectly cooked. 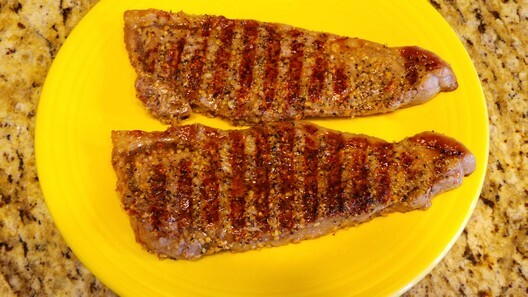 For my next cook I decided to grill some New York Strips for breakfast. I decided to grill these to a nice medium. 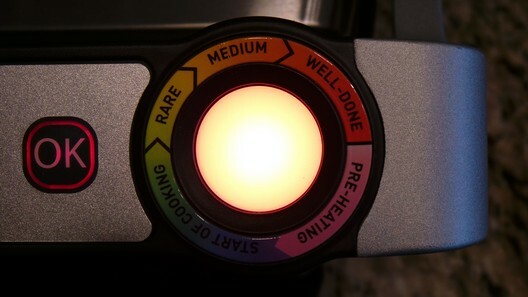 Then I selected the steak cooking mode and pressed the “OK” button and waited for the grill to pre-heat. 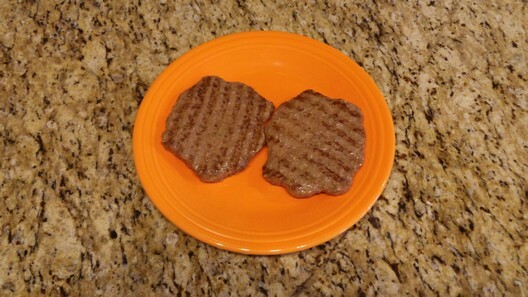 Once the OptiGrill was pre-heated I placed the steaks on the grill to cook. After around 5 minutes of cook time the indicator light turned orange and the beep sounded. 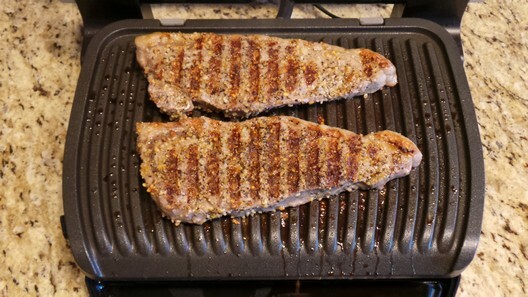 I then opened the lid and removed the steaks from the Optigrill. 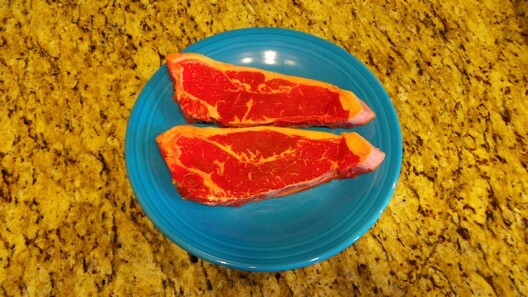 I was pretty impressed with the grill marks, tenderness and juiciness of the steaks. They were also cooked to a perfect medium as you can see in the picture below. 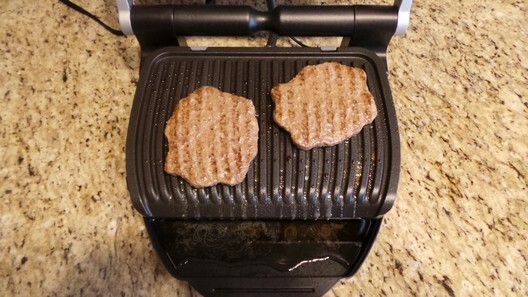 I am really impressed with the OptiGrill. It was a very user friendly grill and both meats I cooked on it turned out perfectly. 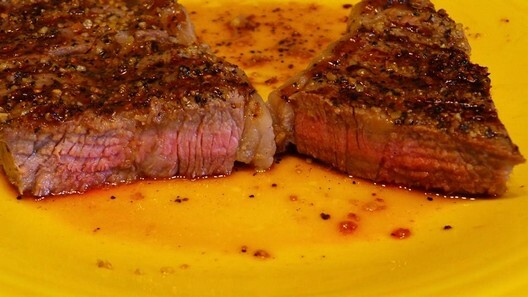 I also like the fact that if my wife likes her steak well-done and I like mine medium, they can be cooked at the same time and removed once the beep goes off for the desired doneness. 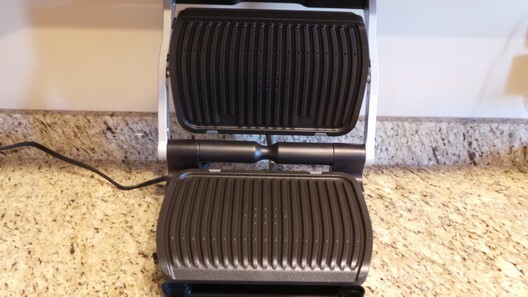 The OptiGrill would be a great grill for those that live in apartments or condos that aren’t allowed to have an outside grill. This would also be a good grill to have to cook on when the weather is bad out. 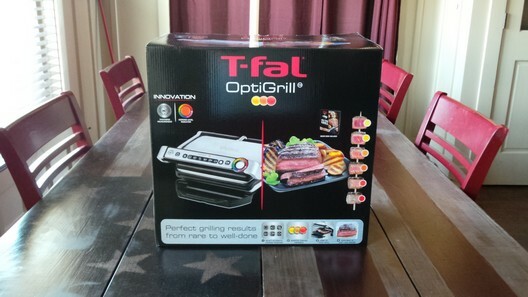 My wife mentioned that the OptiGrill would also be nice to bring with us camping in our 5th wheel since it doesn’t take up a lot of space. 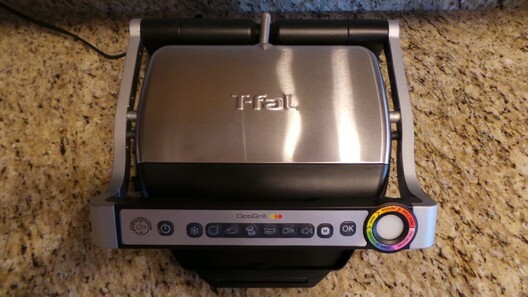 If you’re in the market for an indoor grill, then I recommend looking into the OptiGrill by T-fal. It should definitely be at the top of your list if you’re someone that isn’t allowed to have an outside grill or wants an inside grill that doesn’t take up a lot of space! You can purchase the OptiGrill here. 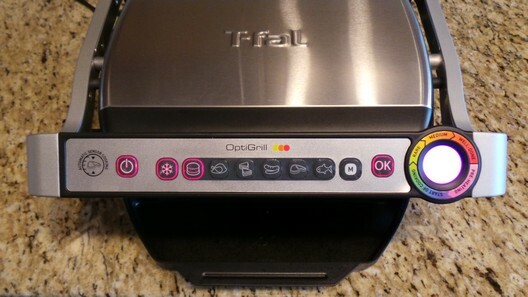 For more information on the OptiGrill by T-fal please visit their Facebook, Twitter, Google+ and YouTube pages as well as their Website. Make sure to check back soon for another BBQ Tools & Tech Review! Best review I’ve ever read. Thank you!! Thanks Patt! I appreciate that. Glad you enjoyed my review. Thanks for leaving a comment! Thinking about asking for this for Xmas. Thanks for this thorough review! With step-by-step photos of the cooking process, no less. Very informative. Thanks for leaving a comment Jenn! Thanks also for the kind words as well. 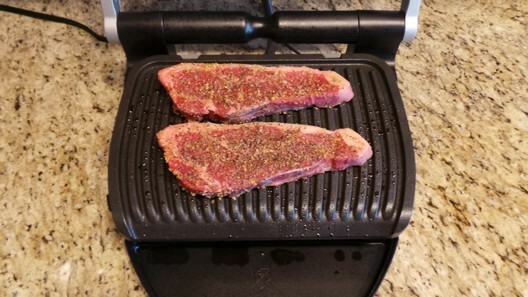 The OptiGrill would make a perfect Xmas gift. Let me know if you end up getting one and how you like it. Thanks again! Great review! I was on the fence about this product, but after your review decided to go ahead and make the purchase. Thanks so much Tom! I really appreciate that! 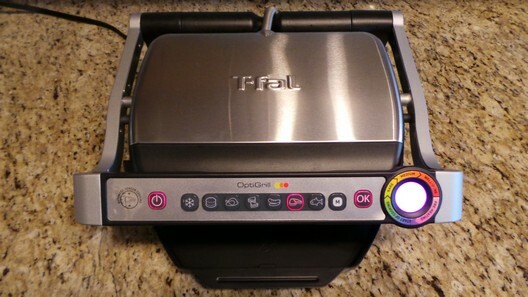 I hope you enjoy your new OptiGrill. Let me know how you like it. Thanks again! Thanks Q, a good review, loved the photos, just ordered one. Thanks John! Glad you enjoyed my review. I’m loving the OptiGrill. Let me know how you like yours after you get the chance to use it a few times. Had mine now for 3 days….. So easy, a caveman can do it!